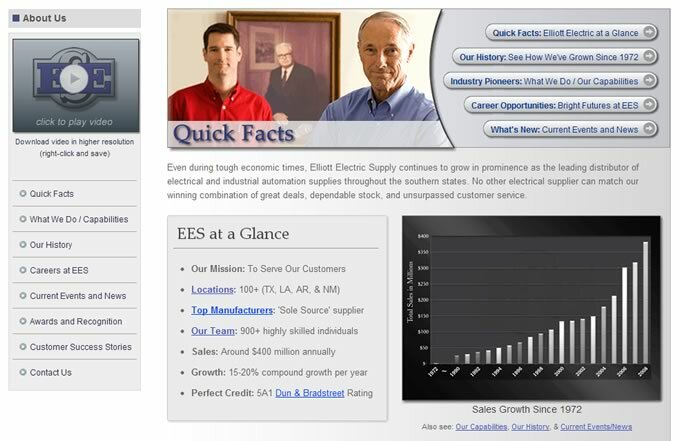 At Elliott Electric Supply, we are constantly striving to provide you with the smartest business tools in the industry. 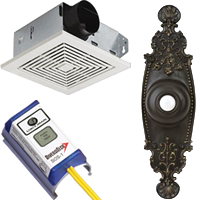 This page offers an in-depth look at the newest and most powerful features of ElliottElectric.com, tailored to fit your needs and save you time and money. For a quick, less detailed overview of what's new to the website, check out the Site Features page, or take a look at our Site Capabilities Brochures. Also, be sure to explore Our Services. Enjoy our one-click ‘Demo’ login to explore the features of ElliottElectric.com without having to register. See real-time inventory numbers and account data around the clock. Give your business the edge with Elliott Electric Supply's premiere online account management system, which we've been continually refining according to your requests since 1995! See Proof of Delivery (POD) signatures, scanned images of payment checks, order status, and more. Take advantage of custom user-management for assigning levels of online access and duties to different users—now more powerful and easier to use. Instant access to all of your favorite tools, improved with you in mind: Custom Lists, Custom Part Numbers, Quotes, and Rapid Orders—all of which can be copied and cross-converted. Payments are DigiCert-secured, and our handling of credit/debit cards is PCI-Compliant. Like always, we show you real-time stock levels, but now you can see local, regional, and company-wide inventory numbers—with no need to manually specify your location when searching. Your special quoted pricing appears in product search results whenever you’re logged in. Now featuring more product images and PDF spec sheets on product detail pages. 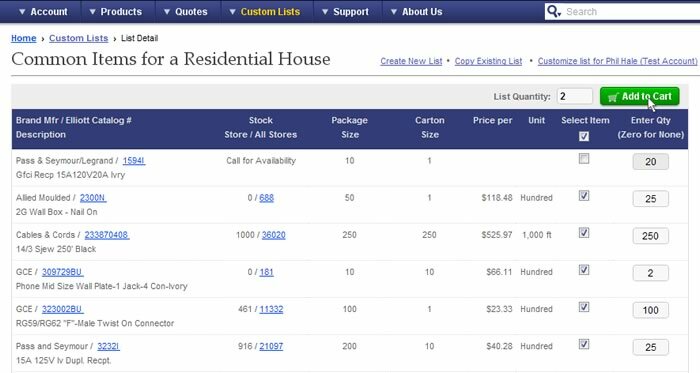 Custom Lists have been significantly improved, allowing you to quickly pick & choose items from a list, set quantities per-item or for the list overall, and add the items to your cart with a single click. Custom Part Numbers have been improved to make loading your own part numbers even easier. 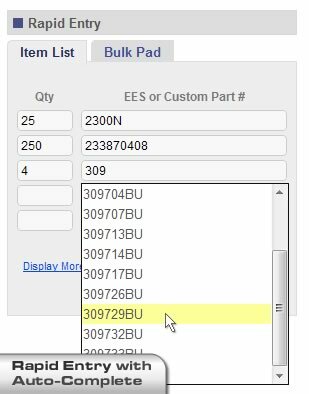 The Bulk Order Pad lets you copy and paste your parts and quantities directly from your computer. 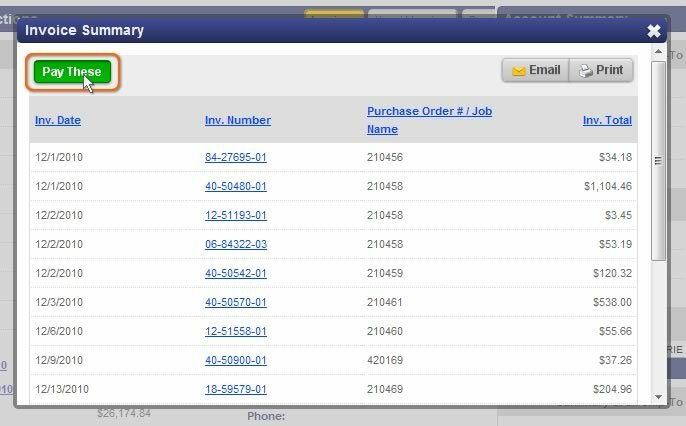 Our Rapid Entry tool for orders (shown above, on the right) now features Auto-Complete, conveniently listing matching part numbers as you type. This isn’t the limited browser-based feature that draws from your past entries—it actually searches our products as you type and lists any matches, making Rapid Entry even more efficient. The Shopping Cart now includes useful links to create quotes, custom lists, and more. 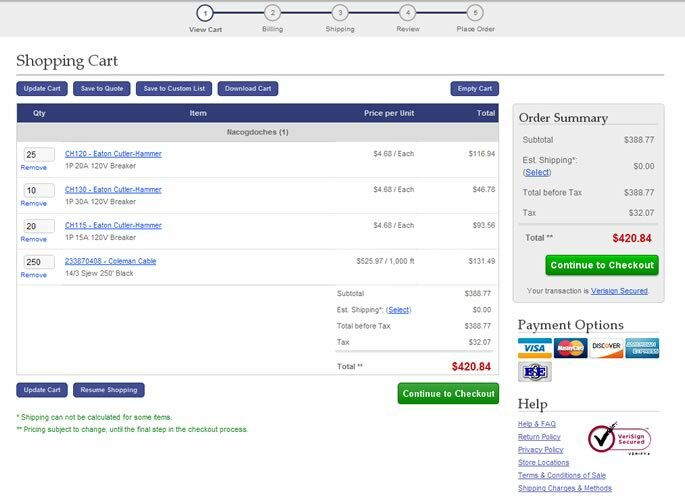 The Cart lists your items according to which Elliott location will be shipping them. Coming soon: you can already elect to Require PO/Job Names in your Account Settings, but soon you will be able to customize a format and require your PO/Job Names to match your defined formatting. Want More? Download the Website Capabilities Brochure. 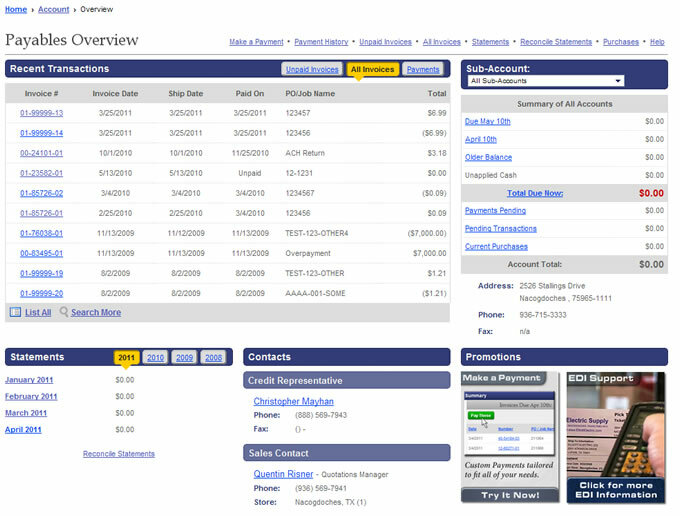 The Account Overview page can be set to Payables Mode to tailor the layout for online payments and billing management. You can click any invoice and view it in full detail without leaving the Overview page. In Payables Mode, all of your monthly statements from the past three years are directly accessible from your Account Overview. 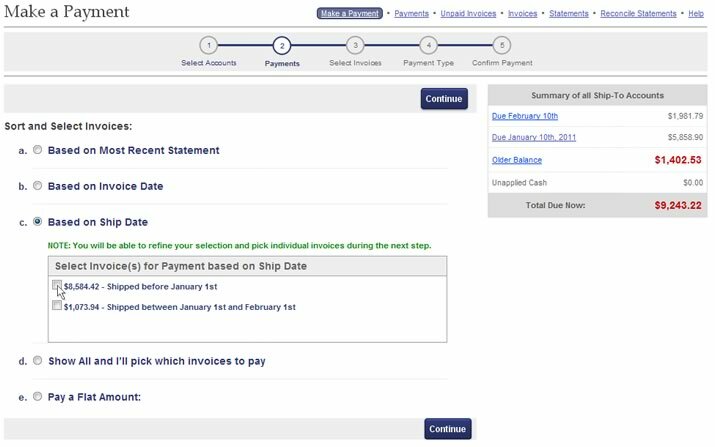 Due Dates can be clicked to reveal the associated invoices (as shown below). Each invoice can be viewed, or you can jump straight to the Payment process by using the ‘Pay These’ shortcut button—all available directly from the Payables Overview page. Drill-down into invoices and see the balance(s) to which they apply. Instantly switch from job to job to view different account summaries. As always, the Overview provides all the essential contact info you need to get in touch with your Elliott credit or sales representatives. Most invoice reports now include the relevant ship date. Per our customers’ requests, our online Payments process has been optimized to give you a wealth of handy shortcuts, so there’s no need to wade through long lists of invoices. We’ve also added the option to pay a flat amount, and your due dates are shown during the payment process. Our 'Make a Payment' page now utilizes a payment scheduling system, allowing you to set up your payments in advance by picking a date during the current business month when you would like the payment to be made. Enjoy all of our usual shortcuts for selecting invoices to pay. Set up as many scheduled payments as you like. Payments can be scheduled for any business day that falls before the 25th of each month. You can cancel scheduled payments at any time, up until the day the payment is made. On your Payment History page, as well as on your Payments list on your account overview, you can see any scheduled payments and click to view the invoices that will be paid by the selected payment. When viewing these invoices you have the option to cancel the scheduled payment (unless it is already pending). Have an online account? Try it now! The 'Make a Payment' page now allows you to automatically split your online payment by sub-account. This means an individual ACH transaction will be made for each job/sub-account that has invoices marked for payment. 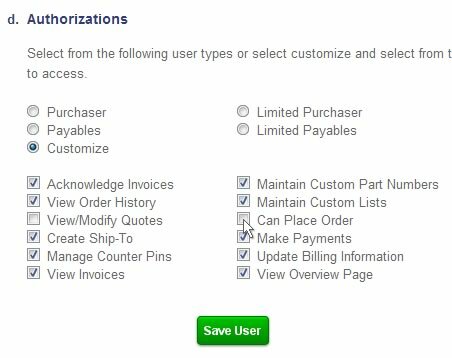 The ways you select invoices and submit your payment remain exactly the same. This is a huge time-saver if you normally pay your job/sub-accounts one at a time. Now, simply mark all the invoices you want to pay, and choose "Split payment by Sub-Account" so that a separate transaction will be generated for each sub-account involved. You can now see which invoices were paid on each payment, for all types of payments. Invoice details pages now include the option to download directly to PDF, in addition to email, fax, and print options. Transfers between accounts are now easier to track. Our handling of debit/credit card information is 100% PCI-Compliant. Managing users with different access and duties is now even easier. Elliott Reward Dollars are essentially cash in your pocket! As you earn them, you can either apply the dollars to your account balance, or redeem the money in the form of widely accepted MasterCard gift cards. How to earn Reward$ – Begin receiving all of your invoices exclusively through email and earn a reward of $0.10 for each and every invoice. Invoices appear immediately in your inbox. Choose which digital file type is best for you. The $0.10 per invoice that you earn can really add up before you know it! Going green pays off – use less paper, ink, and fuel, and save time and money in the process. Our main navigation at the top of every page now consists of drop-down menus that expand when you hover your mouse over them. In addition to greatly reducing the amount of clicking and page loading required to navigate our site, the hover menus have allowed us to provide one-click access to just about any page, from anywhere on the site! 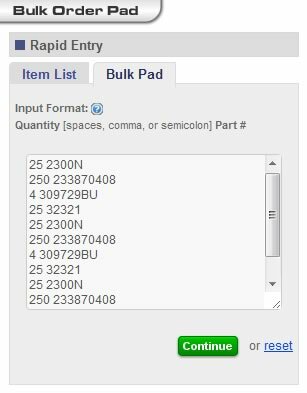 We’ve added the Bulk Pad to the Rapid Entry section of our homepage, so you can quickly type or copy-and-paste items to your shopping cart, directly into checkout, or into a new request for quote (RFQ). You can now Find a Store directly from our homepage by typing any entry you want into the dedicated ‘Find a Store’ search box. Search by city, state, zip code, area code, or Elliott store number. Our main search box has been vastly improved. 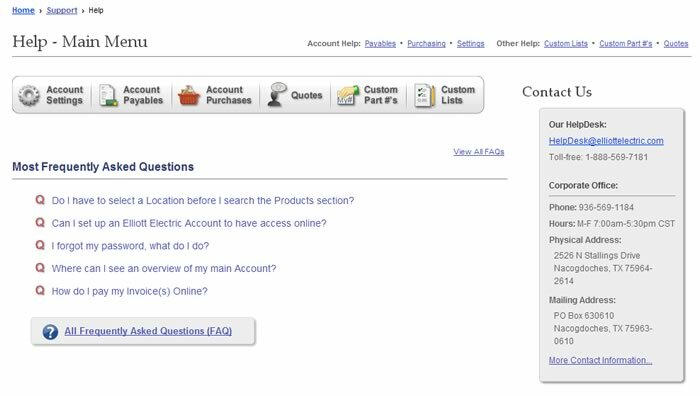 It now serves as a universal search tool, accepting any keywords to search Elliott products and other areas of our website. Enter the name of one of your Custom Lists to search for the listed items only. 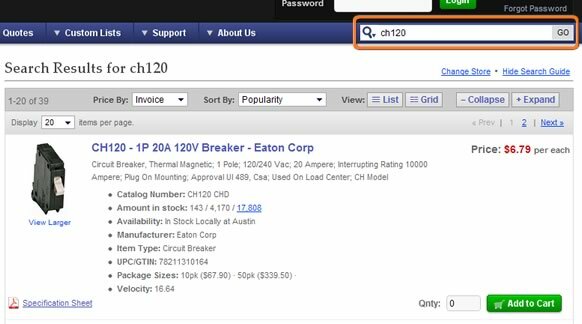 Search by using your own Custom Part Numbers, including the custom descriptions you’ve entered for each item. 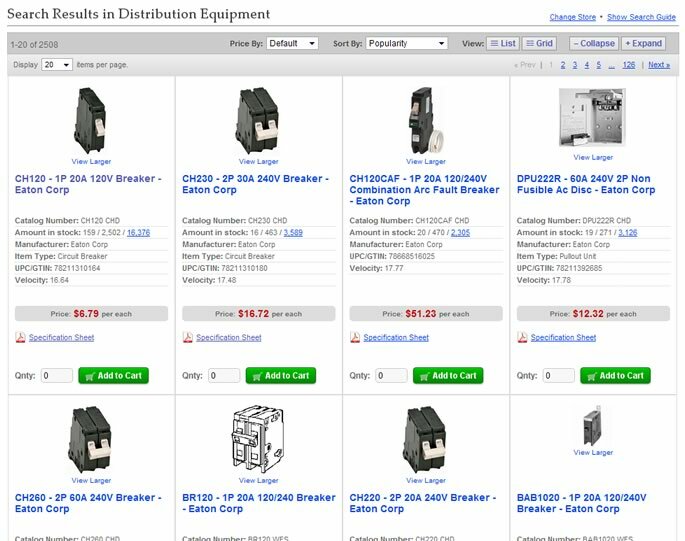 The search box accepts full or partial part numbers, manufacturer or brand names, item descriptions, UPC codes, and much more. Our Products search results now feature a variety of new layout and sorting options. Sort by popularity, availability, or price. On-the-fly adjustment of how pricing is displayed—by unit, foot, inch, package, or carton. Available layouts for your search results include the traditional-style list layout or the new grid layout, each with options to expand or collapse, for more or less details, respectively. The expanded view shows images and more detailed info, while the collapsed view is best for fast, streamlined browsing. Enjoy complete control as you customize your search results without ever having to leave the results page. Featuring a great, new interactive map containing all of our store locations. 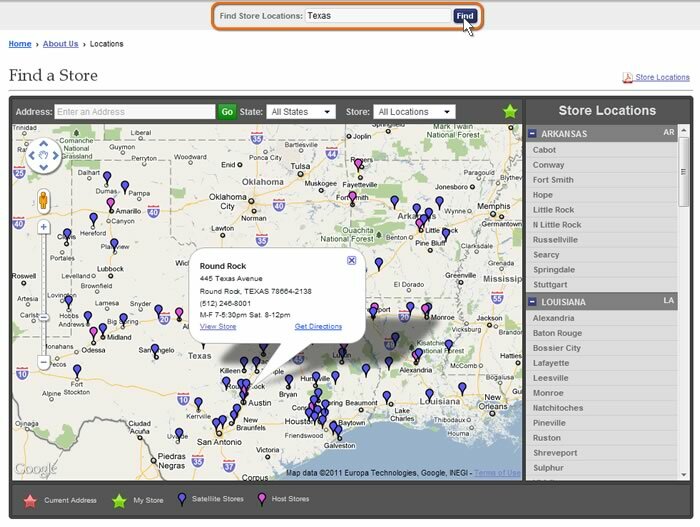 The map offers built-in tools for searching stores and getting directions without leaving the page. 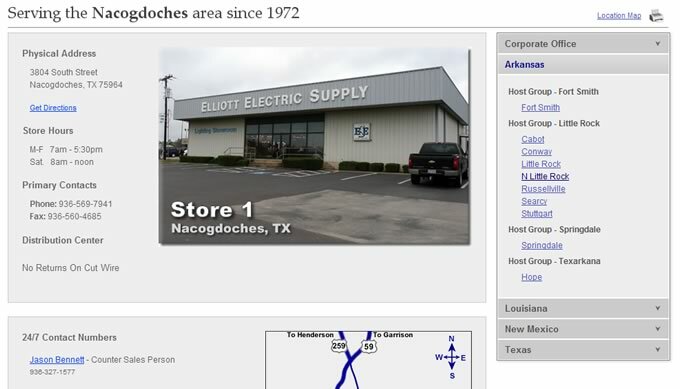 The new locations search tool lets you find Elliott stores by entering zip codes, area codes, store numbers, city names, or state names & abbreviations. Each store’s details page is more useful than ever. View a location's contact info and address, storefront photo, local map, 24/7 emergency service contact numbers (when logged in), and more. Our new Frequently Asked Questions page covers the entire site, with quick help info and useful images. For more detailed help, the new Help section offers a full help page for each section of our site, including images and other graphics. Company Contact Info page that provides ways for customers and vendors to contact us. 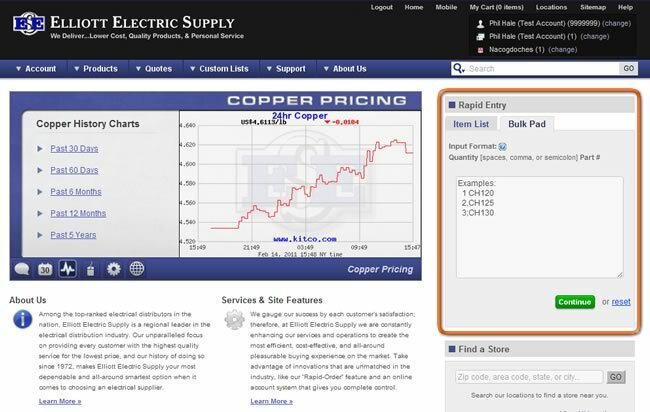 Interactive pages for exploring our site features and convenient services provided by Elliott Electric Supply. Useful new menus for Resources, Documents and Policies. Informative pages like Quick Facts, Our History, General Capabilities, Company Awards, and Customer Success Stories. One central page for company news, new feature releases, and upcoming events for our customers—linked to our homepage’s main promotion rotator as well as the interactive Events Calendar. 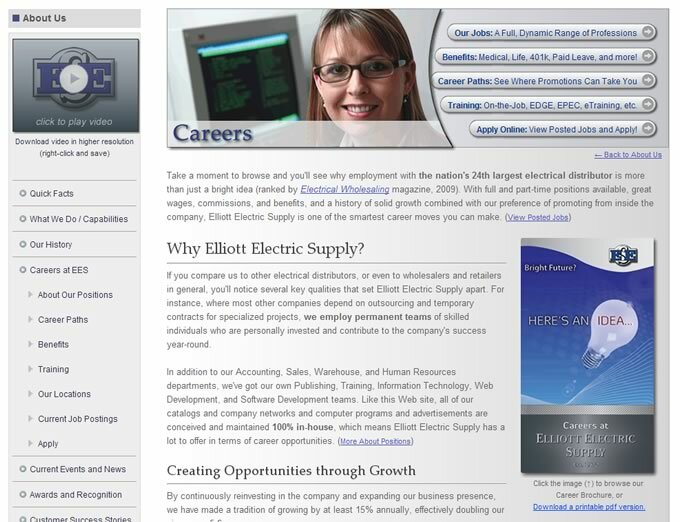 An all-new Careers section with extensive information on employment at Elliott Electric Supply. The new Career pages cover Elliott Job Descriptions, typical Career/Promotion Paths, Benefits, company training, and, of course, our system for online job applications.